That much was clear from the brink of war early on in the Trump administration. Just as important as the message was the messenger. North Korea’s vice foreign minister, Choe Son Hui, delivered the warning during a briefing in Pyongyang on Friday with foreign diplomats and journalists. Choe is an denouncing U.S. Vice President Mike Pence as a “political dummy” and threatening a “nuclear-to-nuclear showdown” with the United States. 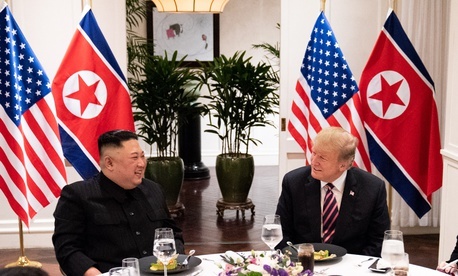 But it’s also a sign of the paradoxical outcome of a summit that was intended to dramatically defuse tensions between North Korea and the United States: Each side has come away with the recognition that despite all the pageantry there’s a huge gulf between their positions, and with the conviction that exerting pressure is the key to getting the other side to come around to their preferred approach. The Americans think sanctions will force the North Koreans to fully renounce their nuclear program. The North Koreans think the further development of their nuclear arsenal—through ongoing production of nuclear material, recent reversals of moves to dismantle a rocket site, and now the specter of more tests of ballistic missiles and nuclear weapons—will compel the Americans to settle, for the time being at least, for something far short of full denuclearization. Tough talk from Bolton and Choe is a form of pressure.